A huge thanks to everyone who entered our “WIN A TRIP TO NEW YORK CITY” Facebook giveaway. Almost 3,000 people liked us, entered and participated. We’ve picked our lucky winner, and we’re so happy to announce it. THE WINNER IS…Danielle David Grinnen! We were excited to learn that Danielle is a designer of custom handmade rugs. Her company, Deliante Designs can also be found on Facebook by clicking here. You can also follow her blog here, and her twitter here. Danielle and her guest will be flying out to New York this week, staying at Sixty Thompson in Soho, getting a tour of The Shade Store’s showrooms in Manhattan, and will be walking the show floor of the International Contemporary Furniture Fair® (ICFF). Then, who knows what events and parties they’ll find. 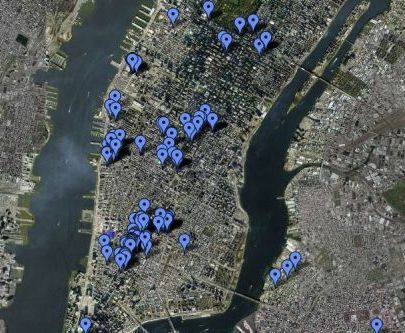 Looking at the below NY Design Week map, I can’t imagine they’d run out of options! Thanks to our partners DwellStudio and Robert Allen for helping us get the word out! Here’s to a great ICFF!